If you are outside of the U.S. when you are invited to Fermilab as an employee or a visitor, you will need to obtain a Visa Stamp. All visa holders seeking to travel on Fermilab business outside the U.S. and planning to apply for a new visa stamp while abroad must fill out the Visa Application During Travel Form and follow the instructions for its submission. • The first step is to pay the I-901 SEVIS fee. • You must have your DS-2019 or Form I-20 when accessing this online payment site, because you will need the certain data from these forms. • The SEVIS ID # begins “N000”. • The Program number begins “P-“ and then has either “3” or “1” and then has 5 more digits. 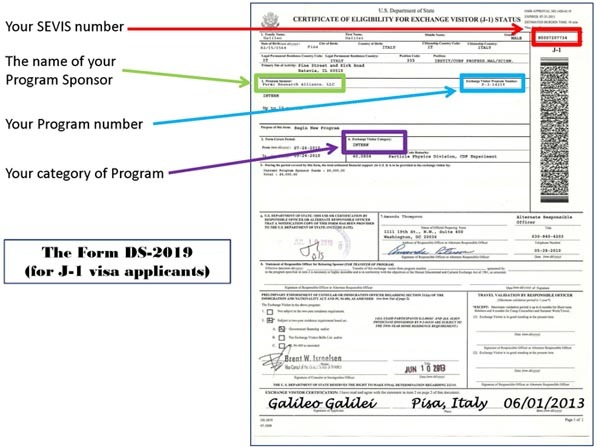 • The Program Sponsor must be the name of the organization that is designated to approve your J-1 or F-1 participation; you must check your Form DS-2019 or I-20 to be sure of the precise organization name. • The category of Exchange Visitor also is listed on your DS-2019 or I-20 (ie Research Scholar, Intern, Undergraduate Student, etc.). • You must bring the I-901 fee receipt to your visa interview. • Additional documentation required for your visa application may be found at the website of the U.S. Embassy or Consulate where you will be applying. This is a listing of all the different U.S. Consulates and Embassies worldwide. Select the city where the Embassy where you will apply is located. You will be directed to the main website for the Embassy. Go to the Consular Section, and review the local procedures for applications for the class of visa you will obtain. This is standard U.S. visa application form used by all US Consulates. It is an online form that self-selects additional questions based on the answers already received from the applicant. It must be either accessed from the Embassy or Consular website where the applicant will submit the visa application or the correct consulate must be selected from the drop down menu at the Department of State’s Consular Electronic Application. You may wish to review the FAQs for the Form DS-160. Follow the local Consulate’s procedures to book your visa appointment. The appointment date should be 2 months prior to the date you want to actually enter the U.S. You can check the DOS website for the visa appointments availability. If the appointment date issued to you appears too late for your planned travel to the U.S., check the Consulate’s website to see whether there are instructions for getting an expedited appointment. There also might be a number to call to speak to the appointment reservation system (which usually is a private company unrelated to the U.S. Consulate itself). In some Consulates, it is possible to check back each day to see if appointments on earlier dates have become available due to cancellations. If you cannot get a visa appointment in sufficient time to visit the U.S. by your desired date, please complete email the Visa Office. On the date of your interview, go to the Consulate with all the paperwork recommended to you by the Consulate and this website. Many other people will be assigned the same date and time. You will not be permitted into the Consulate until your specific appointment time, so there is little point in arriving very early. Do not, however, arrive late. You must wait outside the Consulate until they admit you, so be prepared for weather, etc. U.S. Consulates worldwide have instituted stringent security policies. As a result, the following are prohibited: electronic devices of any kind (including cellular telephones), backpacks, suitcases, attachés or briefcases, strollers, or similar items (for example, many embassies prohibit any more than one baby bottle). Security personnel will not store items for visa applicants and will confiscate all weapons. Accordingly, if you bring to your interview an item that cannot be allowed into the building, you will lose it permanently or be refused admission to the building. If you have concerns about whether a specific item will be allowed into the building, please contact the Consulate. Your current passport, valid for at least six months longer than the anticipated stay in the U.S., and with at least three free/unmarked pages. If you have held previous passports, please also take them to the Consulate on the day of the interview. Invitation Letter (for visitors), or an Employment Offer Letter or Employment Confirmation Letter (for Fermilab employees). Evidence of your credentials, such as copies of degrees or diplomas, if available. Evidence of income, such as earnings statements, if any. Your original Form I-797 Notice of Action approving your petition. Evidence of immediate family (such as parents) in your country of current residence (if applicable). Evidence of ownership of property in your country of current residence, if any. It often is helpful to bring with you an original and one copy of each document, so that you can show the original to the Consular officer and then give them the copy, thereby eliminating the need for them to make copies themselves. When you are called for your interview, you must give your documents to the Consular officer. The officer then asks questions, such as about the proposed visit to the U.S., and your credentials and current activities. You must be able to understand and then answer the questions asked. Consular officers do not like being ask to read documents instead of being answered. They want you to be able to answer their questions, so that they know the information is coming from you instead of whoever prepared the paperwork. Your answers also should be understandable, rather than scientific. The officer must understand what it is you do now and what you will do while in the U.S., and confirm that the activities are not potentially threatening to U.S. national security. During your interview, you will be fingerprinted and subjected to certain “normal” security clearances. These are done during every visa application, regardless of your personal history or credentials. Many non-U.S. citizens who visit Fermilab must undergo security clearances before being issued their visa stamps. This is a result of U.S. law. The decision to run the security clearances is based on a combination of factors, including your credentials, education, and field of expertise, your nationality, name, and age, the places you have visited in the past, and a variety of other elements. Once the decision is made by the Consulate that security clearances are needed, there is nothing that can be done until the security clearances are complete. The security clearances are conducted against international and U.S. criminal, immigration and other databases. In some cases, security clearances are completed within a few days. In other cases, the security clearances take two or more weeks – in some cases, it can take months. In rare circumstances, the security investigation might generate an adverse preliminary answer, which the Consulate then generally double-checks, and which then takes more time. If, at the conclusion of your interview, the Consular Officer indicates that your visa application will undergo administrative processing, please email the Visa Office. Neither the U.S. Consulate, nor Fermilab, can speed up the time taken for security clearances, by law. 5. Contact Fermilab to confirm your travel plans, and Travel to the U.S.
Canadian Citizens’ passports are NOT required to be valid for six months past their intended date of departure. Their passports must only be valid up to the date of their intended departure. All Canadian Citizens entering the United States by AIR are required to present a valid passport, or a NEXUS card when departing from a designated Canadian airport. You will need to bring certain documents with you once you arrive onsite at the Lab. If you are a User/Visitor please see the Users Office staff for assistance. If you are an employee you will be directed to the Visa Office on your first day of work.